Dealer Login or Apply for a Dealer Account. This cable will only work with power adapter with 1.3mm x 3.5mm plug and not other sizes. Extend your camera's regular DC power supply to up to 4 meters in total! 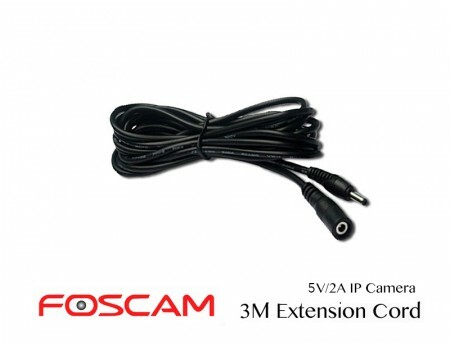 ***Foscam outdoor models FI8602W, FI8620, FI9801, FI9802, FI9804, FI9805, FI9828W, FI8919W, FI9828P, FI9800P,FI9803P,FI9853EP, FI9851P, FI9900P, FI9900EP, Foscam NVR are not supported as they are running on 12-Volt power. Please check your power adapter voltage before you purchase. Max one extension per camera is recommended. More than one extension may cause voltage drop and the camera unstable.